Don't mess with Claret. She's a feisty one! I've already mentioned this in my First Impressions post for this game but I don't generally like Japanese Role-Playing Games (JRPGs). I like people who try things different with the genre such as what was done with To the Moon or more recently Always Sometimes Monsters but if it's a traditional JRPG then I'm usually out. However, I do happen to own a copy of RPG Maker and I'd like to someday in my free time ("hah!") make a game with it so it always pays to check out the competition right? Well thanks to the generosity of the master of Steam games, Mix-Master, I managed to score a free copy of an RPG Maker game (cheers bro). That RPG Maker game happens to be Skyborn. So I eventually gave it a shot and while it ended up confirming why I disliked the genre it had some redeeming qualities as well. Here's what I thought. You play the role of a young woman named Claret Spencer who is apparently a mechanical genius. She lives in a Steampunk world where humans, despite their prowess with technology, are treated as second-class citizens and are ruled by a race of winged warriors known as the Skyborn. Claret's world starts to eventually turn upside down and it's not long before she's involved in a conflict to decide the very fate of the world itself. While Skyborn's plot is your typical epic fantasy adventure to some degree it has some things going for it. Firstly, the setting is very reminiscent of an older RPG called Arcanum in that you have a world that has both steampunk technology and magic - a setting that has always appealed to me. Also, despite the forces of good fighting the forces of evil, the characters you'll meet and the ones even in your party, aren't two-dimensional. All have skeletons in their closets and the fact that they're all fallible makes them seem more real, more human - and as a consequence you start to develop an attachment to the characters. That's definitely something you want in an RPG and the game feels a lot less childish to some of its competitors. I also liked the fact that Dancing Dragon knew how to make a proper epilogue. Thank God. You have no idea how hard it is to find a game nowadays that takes the effort in telling you what has happened to your beloved characters. This is one thing Skyborn achieves admirably although it does seem ripe for a sequel though. Skyborn is for all intents and purposes your typical JRPG. That means a linear storyline, no character customisation and turn-based combat which is heavily reliant on number crunching. They do try to do things slightly different by adding a simple crafting system which I liked, but that's about it. Consequently, I really disliked the combat and to make matters worse, the battles aren't easy, especially if you don't put in the time to grind your characters to as high a level as possible - if you don't, they get smashed. Unfortunately, even if you do manage to kill all mobs of monsters on the way there's still a chance you can lose with some bosses since it's all decided by the RNG (Random Number Generator) God. I know it's pretty normal for RPGs to be reliant on dice rolls - even Western RPGs do this. However, I've always found that JRPGs are really the sort of games that reward the completionists or perfectionists out there that explore every nook and cranny in a game. While I tend to do this somewhat in Western RPGs too, I only do so if it adds to the story. I don't want to spend time killing the same mob of monsters 100 times if it doesn't offer any tangible reward except experience - that's just grind. I might as well go play an MMORPG if that were the case! Anyway, when I dropped the difficulty down from "Normal" to "Easy" at least the battles seemed manageable for the latter half of the game. It's a shame that the game is so difficult on Normal difficulty since any JRPG n00bs like myself would've probably given up by then and not experience the story when it starts to pick up. Oh one more thing I disliked: the fact you only get four save game slots. I'm not sure if this is a limitation due to RPG Maker but it's an annoying one if it is. I prefer orange jelly thanks. There's no voice acting and there's only very basic sound effects used. So basic that they may have in fact used stock sound effects that come with RPG Maker. While it's fine to use the default sounds if they make sense (e.g. gunshots when you use a rifle) some of the sound effects seem a bit lazy, such as some weird synth waveform for when your character uses the "Taunt" ability - something resembling a shout or an insult would've been better. While there are some good tracks here there's a lot of stuff that sounds like MIDI and sometimes you even get some cheesy 80s rock music for combat - but that's very typical for retro JRPGs anyway so it's not entirely out of place. The game has your typical JRPG graphics: a cute, retro representation of the world with manga-style avatars whenever party members speak. 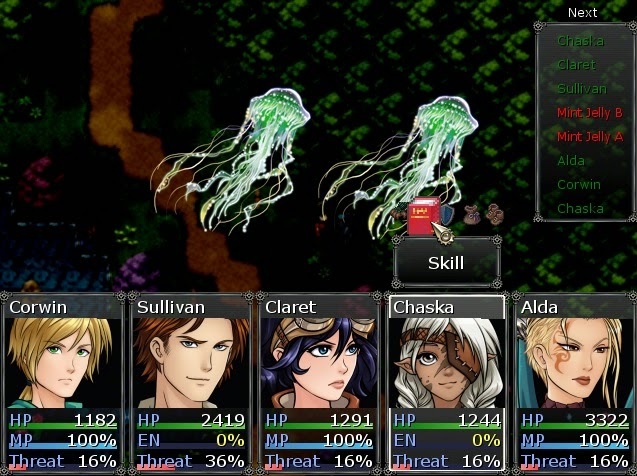 While I liked the artwork used for the party members the rest is pretty stock-standard stuff - in fact, I'm pretty sure some RPG Maker assets were reused. I believe the battles are too difficult on normal difficulty, at least for JRPG n00bs like myself, and as a result I didn't enjoy the game at first since not only did I have to put up with a dull combat system where I didn't feel like I was in control, but I had to deal with the odds being stacked against me too. Fortunately, setting the game on "Easy" difficulty actually seems just about right for anyone not accustomed to JRPGs (and I recommend you play on this setting if you're in a similar situation to me). The game seems rather linear with no Steam achievements or trading cards so I don't know if there's much incentive to go replay the game anyway. RPG Maker games seem to have issues integrating with Steam and Skyborn is no exception. F12 seems to be the hotkey for restarting the game so I strongly recommend not trying to take a screenshot while playing the game through Steam! There's also no Steam overlay as well which means alt+tabbing in order to respond to messages or browsing the web. I'm not a fan of JRPGs and while Skyborn tries to innovate it's ultimately not enough to make me forgive the linear nature of these kind of games or the fact they're unforgiving if you're unwilling to grind for an obscene number of hours. 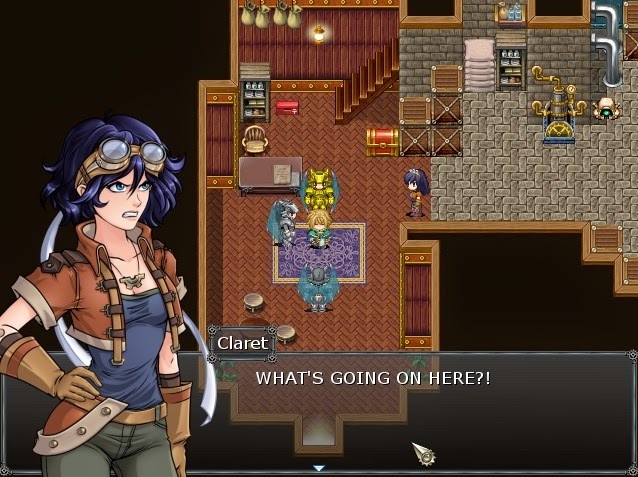 Skyborn did surprise me with its plot though since it's much better than your typical JRPG and if you're willing to pay the $14.99 USD you may indeed develop an attachment to its Steampunk setting and intriguing characters.